These cookies are always a late spring special at Milk & Cookies Bakery. The combination of tart cherries and white chocolate makes me think of the cherry trees that blossom along many Greenwich Village streets in the spring. Put the cherries in a small heatproof container. Put the orange juice in a small, nonreactive saucepan over medium heat and bring to a boil. Immediately remove from heat and pour over the cherries. Set aside to plump for 30 minutes. Drain the cherries through a fine-mesh sieve, discarding any excess liquid. Set the cherries aside. Preheat the oven to 350°F. Line two baking sheets with nonstick silicone baking mats or parchment paper. (Alternatively, use nonstick baking sheets or lightly butter conventional baking sheets.) Set aside. Prepare the Oatmeal Base Dough (see below). While the dough is still streaky, remove the bowl from the mixer and scrape the paddle clean. Using a wooden spoon, stir in the chocolate chips and drained cherries, mixing until evenly distributed. You can also do this in the mixer, but heavy mixing tends to break up the chips and cherries and the baked cookies will have an undesirable dry texture. Using a tablespoon or small ice-cream scoop, make mounds of dough. Roll the dough into balls about 2 inches apart, on the prepared baking sheets. Using your palm, gently flatten the top of each cookie slightly. When all of the cookies are formed, place in the oven and bake for about 15 minutes, or until lightly browned around the edges. The center should be slightly soft to the touch. 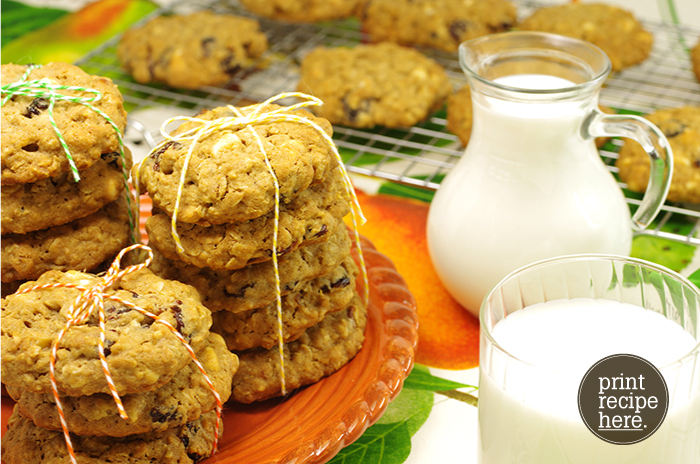 There is nothing more classic than cookies made with this oatmeal cookie dough. They come out both chewy and crunchy. The hint of cinnamon makes them a bakery favorite. Our customers particularly enjoy them with a cup of steaming hot chocolate on a snowy Greenwich Village day. Combine the flour, cinnamon, baking soda, and salt in a mixing bowl. Set aside. Put the butter in the bowl of a standing electric mixer fitted with the paddle. Begin beating on low speed. Add the brown sugar and granulated sugar, increase the speed to medium, and beat for about 4 minutes, or until light and creamy. Add the eggs, one at a time, and beat to incorporate, scraping down the sides of the bowl with a rubber spatula after each addition. Beat in the vanilla and when blended, slowly beat in the reserved dry mixture together with the oats. While the dough is still streaky, remove the bowl from the mixer and scrape the paddle clean. It is very important not to over mix this dough or the cookies will be dry and hard when baked. Using a tablespoon or small ice-cream scoop, make mounds of dough Roll the dough into balls about 1-1/2 inches in diameter. Place the balls, about 2 inches apart, on the prepared baking sheets. Using your palm, gently flatten the top of each cookie slightly. NOTE: Dough can be stored, airtight, in the refrigerator for up to a week or in the freezer for up to a month.